Back in the day when I was a Director for an international association or two, I got to travel quite a bit on my employer’s dime. It was always the right amount of travel – enough to feel comfortable zipping through airport security, and not so much that I forgot my home address. I left that job and that lifestyle four years ago. When you’re self-employed, the idea of work travel suddenly becomes much more costly and much less glamorous. Zipping around the beltway to meet with clients or metroing into the city for a business meeting doesn’t have quite the panache as twice-yearly conferences in Las Vegas. 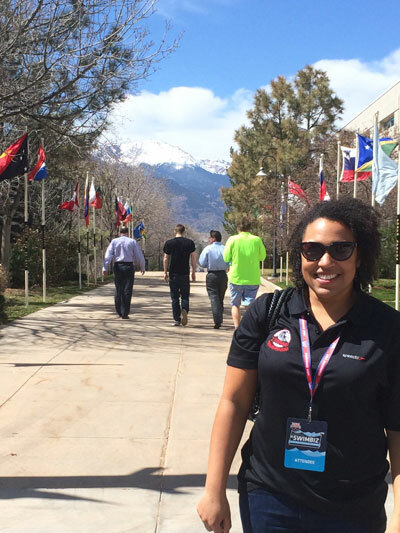 My dry streak ended last month, however, when I got the opportunity to travel to Colorado Springs for the first annual #SwimBiz conference, a marketing and social media conference hosted by USA Swimming. You know that when a conference incorporates a hashtag into its name, it’s serious about social media (and yes, we did watch this video).